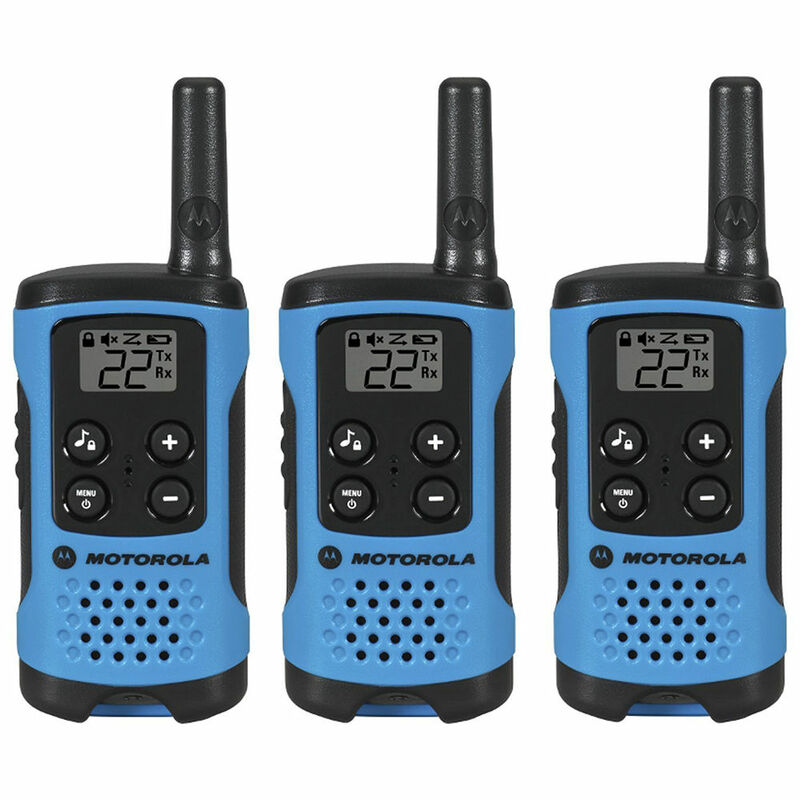 Keep in touch at the mall, the ski hill, or just about anywhere without the need for cell service with this three-pack T100TP Two-Way Radios from Motorola. This radio uses FRS/GMRS channels, and has a range of up to 16 miles. Keypad and call tones indicate when a transmission is being made. The three AAA batteries power the radios for up to 18 hours, with a flashing alert indicating when reserves are low. A keypad lock prevents your personalized settings from being inadvertently changed by requiring a passcode to make alterations; and the time-out feature automatically turns the lock on after a period of inactivity. A belt clip for each radio is included. Box Dimensions (LxWxH) 8.9 x 6.65 x 2.1"
T100TP Two-Way Radio (Blue, 3-Pack) is rated 4.0 out of 5 by 1. Rated 4 out of 5 by Ari T. from Good range, fun for everyone. We use it for fun, a quick, easy way to talk with other people who are in the house, but too far away to hear. Or for going outside and keeping track of kids when they're playing. A good entry to walkie-talkies, surprisingly good range.